The most fun part for me, besides the eating of course, was that at almost every station, the executive chefs were there themselves. They were friendly, personable, and happy to tell you all about the exciting things going on at their restaurants. Most of the places were already on my TODO list (or are places I've been to recently), but of course, I added a few new ones. The list never ends! I decided not to take photos this evening, as there were far too many dishes to take photos of, and managing a drink and all of the food was enough of an ordeal in itself, I couldn't imagine also attempting to take photos. I'm also not going to review each and every dish, again, there were just far too many. Asparagus is especially delicious right now. AQ had a particularly good dish with asparagus prepared several ways - some grilled, some in an amazingly flavorful puree, some compressed. The Village Pub had a fantastic asparagus panna cotta with lemon creme fraiche - creamy, full of asparagus flavor, yum! I'm loving the culinary trend of savory custard/pudding/panna cotta/brulee/etc. Peas are also delicious right now! Spruce's Bellwether Farms ricotta gnudi with fresh peas was pretty delightful - soft gnudi, delicious sauce, and plenty 'o fresh peas. Jasper's sweet pea deviled egg was the winning deviled egg of the night, the pea really making a light and fresh dish out of something normally heavier feeling (which was a pretty big contrast to Marlowe/Park Tavern's version, which was served warm and topped with aged provolone, pickled jalapeño & bacon). Interestingly, the most unmemorable dishes of the evening were the ones I thought I'd like the most: the assorted seafood dishes. Tuna conserva from A16, tuna and caper stuffed peppers from Casa de Case, halibut crudo from E+O, razor clam ceviche from Fifth Floor, brandade from Scala's Bistro, smoked oysters from Commonwealth, and shrimp & pork wontons from Slanted Door were all good, but failed to leave much of an impression. Dosa wins for the best spicing of the evening. The flavors in their Hyderabadi shammi kebabs were incredible. A lot of other places actually really lost in the spicing department, in particular, a lot of dishes were really over salted. Steak tartar, black truffle soil. Most dishes were presented on interesting serving-ware, but the most beautiful plating of the evening, hands down, goes to Alexander's Steakhouse and Prospect (images from their Twitter posts). Alexander's steak tartar was served in a little plant pot, topped with black truffle soil, and tiny adorable flowers. Stunning. And Prospect's Wagyu belly was beautifully topped with pickled mushrooms, onions, and greens. Cupcakes and burgers are still just awesome. Luella's ground sirloin slider with bone marrow butter, topped with aged white cheddar on a soft house-made bun was just as delicious as you'd imagine, even when being prepared catering style like this. And Kara's cupcakes, while ridiculously heavy on the icing-to-cake ratio, were the perfect sweet finish to the evening. Speaking of catering, RN74 really does a great job! I still haven't eaten in the restaurant itself, but their two dishes this evening were among my favorites, and every dish I had at the last event they catered were great too. Tonight's comte walnut tart was fantastic, a mousse-like whipped comte cheese, full of flavor, paired wonderfully with the red wines we were drinking. While I'm definitely a dessert-o-holic, and never go for the cheese platter, dishes like this could convince me to change my mind! They also had the most interesting dessert offering, a black sesame profiterole, filled with passionfruit cream, with some stewed rhubarb on the side. Really balanced flavors and textures, with the fairly savory bready profiterole, the sweet gooey passionfruit filling, and the slightly sour rhubarb. Even my non-sweet liking friend enjoyed a bite of this. I was surprised by how much things met my expectations - even in this strange catering-like setting, restaurants really represented themselves accurately. 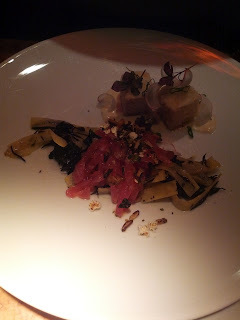 For restaurants I was familiar with, the ones that I've particularly loved had some of the best dishes of the evening. Ones I've been underwhelmed with were underwhelming here as well. And ones at the top of my lists to try out turned out to be pretty great. I was also impressed by what some of the places were able to pull off in this setting, particularly Osteria Coppa, where they were serving up a freshly made nettle gnudi. This was the sort of dish that would not taste very good had it sat for any length of time, and they were executing it really well! I've been feeling a tiny bit burnt out on eating so much of the same sort of food (lots of French, American, Californian), and was looking for somewhere to go with a vegetarian friend, so tonight we decided to try something totally different: Moroccan! But of course, Michelin starred Moroccan :) Aziza has been on my list of places to try for a couple years now, but somehow I just had never managed to drag myself there before. I'd heard great things about the appetizers and desserts here in particular, so we went heavy on those items. We ordered everything that people rave about: the flatbreads and spreads, the basteeya, and the farro risotto, plus some other things that the waitress recommended, or that sounded good. Nothing was standout. I can't pinpoint any direct reason why - ingredients seemed quality, no execution issues, spicing was fine ... it just wasn't particularly good. I really don't understand why they've had a Michelin star for so many years in a row, or why the SF Michelin inspector just tweeted today about how good it was, naming dishes we had in particular. Hmm. Our entire group thought that everything was mediocre and certainly not worth the price or journey. I won't be going back, unless someone really wanted to (the tasting menu sounded amazing, really really appealing dishes, but we weren't up for that this evening ... I might be convinced to try it sometime). The biggest disappointment for me is that the dishes I was most excited about from the online menu (foie gras mousse, walnut tart with black sesame ice cream) were no longer available :( I really wish places would keep their online menus more up to date! I know it isn't always practical for places that change menu items constantly, and we are in spring transition mode right now, but I get so excited for a certain dish that it can be pretty heartbreaking for it to not be there. I don't have much to say about the restaurant or service either. Like the food, forgettable. Decorated nicely enough, friendly enough staff, nothing really interesting to note. Spreads: chickpea, yogurt-dill, piquillo-almond, flatbread. $11. This is, without a doubt, the most raved about dish on the menu Basically every single review you read mentions this dish. The amusing thing to me is that everyone disagrees on which of the trio of spreads is the best, but everyone says you must get this! The flatbread comes fresh off the grill, really nice and warm. They get bonus points for that. And once you are about halfway through the bread, they offer to bring more, and start it grilling then, so that you always have perfectly fresh, warm, grilled bread. More bonus points for that. The flatbread was pretty good, for flatbread I guess. Oiled and spiced, with obvious grill marks. I wasn't crazy over this, maybe I just don't love flatbread? The piquillo-almond spread was very, very smokey. It was a fairly thick consistency and had intense flavor. I thought I'd love this one, but it didn't really do anything for me. I love smokey flavor, and this was sorta just too much, not balanced enough. The yogurt-dill dip was light and refreshing. Our entire table thought it was the best of the three. The piquillo-almond spread was improved if you mixed some of this with it, to balance out the smokey intense flavor. 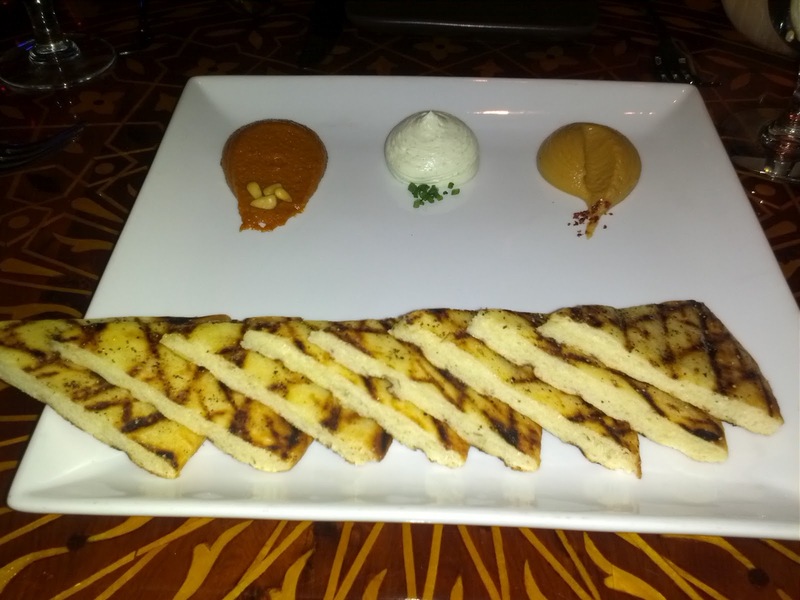 The chickpea was basically a really smooth hummus with some garlic in it. I didn't think it was particularly flavorful or good. I've had much better hummus. I probably wouldn't order this again. I was very surprised to not like this much, since soooo many people have raved about it, and I do like spreads and dips quite a bit (my favorite part of going to the farmer's market is sampling all of the mediterranean dips! Bring on the assorted hummus, aubourgine, babaganoush, yogurt spreads, etc!) It looked like a pretty measly portion, and I was originally worried that with a group of four we wouldn't each get nearly enough and was ready to order a second one immediately, but it turned out, no one even wanted to finish this. Sorta small portion for the price, particularly when so many places include some sort of bread as a complimentary starter to your meal. Sweetbread, bone marrow, romaine, lily bulb. $16. I was curious what this list of ingredients would arrive looking like. The waitress did warn us that the bone marrow would be in the sauce, that we wouldn't be receiving a bone. 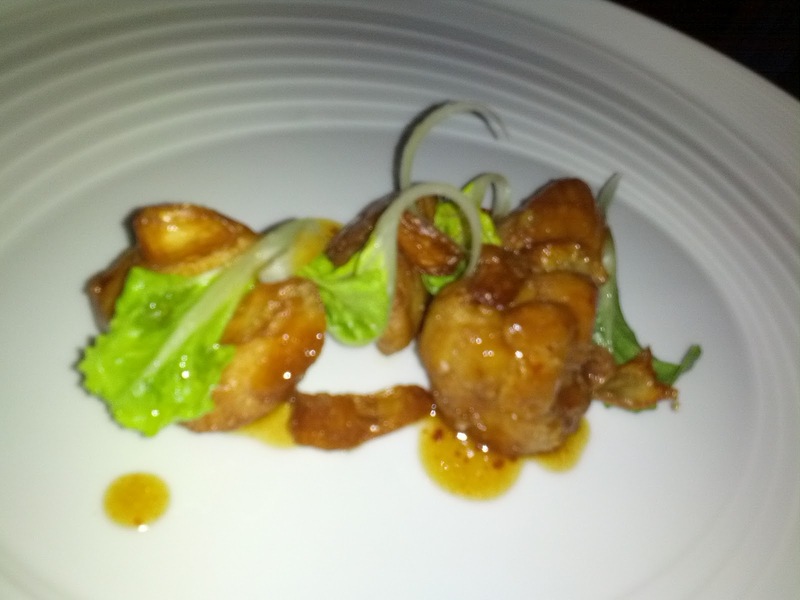 It was ... four assorted chunks of sweetbreads, battered, fried, tossed in a little sauce, and garnished with four baby romain leafs and four tiny slices of fried lily bulb. I didn't pick up on the bone marrow flavor at all. In fact, the sauce was pretty tasteless. I have no idea why there were little romain leafs on here, they were too tiny to add anything, but kinda large for a garnish. The fried lily bulb was tasty little crispy bits, but absolutely tiny and lost. The sweetbreads were decently done, well fried, not too greasy, but they kinda just tasted like chicken. I wouldn't order this again, bland and uninteresting. Portion a little small for price. 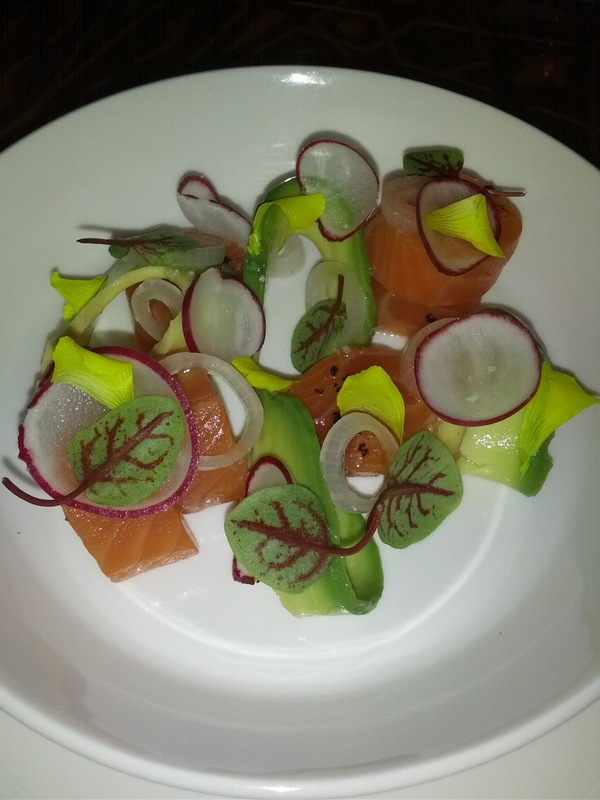 Ocean trout, avocado, radish, pearl onion. $14. Recommendation from the waitress and by far the best thing of the night. Perhaps the only dish I actually would say I liked. The trout was really quite good. The texture was perfect, slightly firm, but still soft and enjoyable to eat. It was lightly cured, just enough to give it some complexity but still allowing the pure flavor of the fish to come through. There were six round chunks in here (the round shape was a little strange, but whatever), which seemed like a good portion for the cost. The trout was also topped with a tiny bit of black salt. It was the prefect amount, as it was really intense, and any more would have been way too much, but the tiny bit accenting the fish really nicely. The radish slices and leafs added a fresh springtime feel to the dish. I only had a tiny chunk of the avocado since I'm allergic, but it seemed fresh and complimented the trout well. The pearl onions were a complete surprise - they were pickled! They had a great flavor to them. 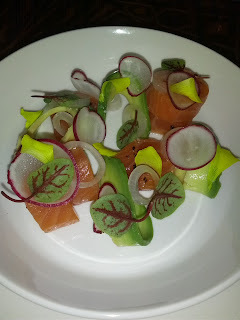 I can't say they paired with the trout all that well, but with the radish they were fantastic. I'd love them on a salad. 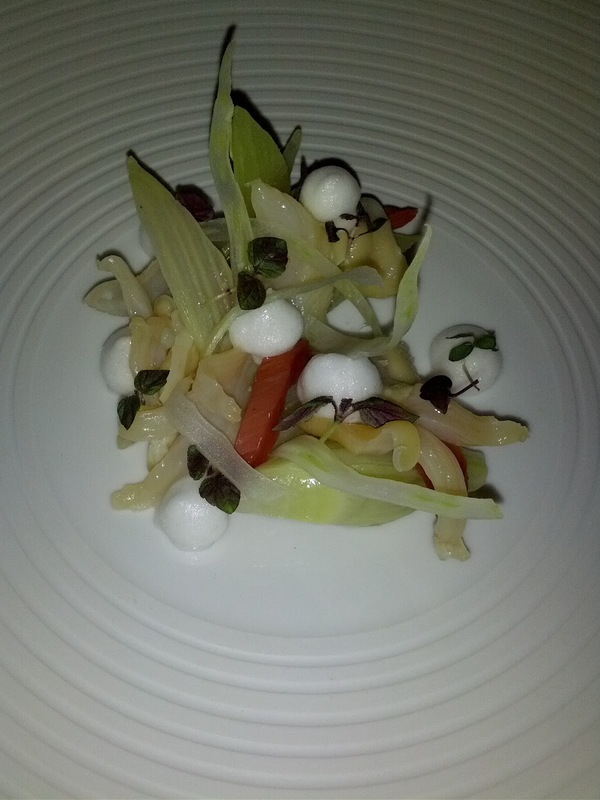 Geoduck, fennel, rhubarb, ginger, shiso. $16. I had geoduck for my first time just a couple months ago at Quince, where it was served as a side to a main dish. I'd heard of it before, but it is a fairly rare ingredient, and one I just hadn't really had the chance to have before. I fell in love with it on the spot. So amazingly good. That was a cooked preparation. When I saw geoduck on the menu, and my fellow dining companions were interested in having it too, I was very excited! After I ordered it, the waitress asked if we knew what geoduck was. Then she sorta stopped herself, saying "well, you knew how to pronounce it, so you must know! ", but proceeded to warn us that it was a raw preparation. This was a theme of the evening: I'd order the dish, and the waitress would warn us about it. I wonder if they have a lot of problems with people expecting different things than they receive, which I could easily see, given the vagueness on the menu. Anyway, there were some slices of raw geoduck, a few chunks of fennel, some compressed rhubarb, and a foam of some sort. None of the components in this dish really seemed to go together whatsoever. The geoduck wasn't very good. Slightly chewy as you'd expect, but had a very strong ocean taste to it. The fennel was inedible. Impossible to cut even with a knife. The rhubarb was nice, compressed into some little logs, providing a sorta sweet yet tart component to the dish. The only bite I liked in this dish. I have no idea where the ginger or shiso were, I didn't see nor taste them. I'm not sure what the foam was, it didn't have any flavor either. Would not order again. No one wanted to finish this dish either. Price a little high for the amount of geoduck, as the most significant thing on the plate was the fennel. 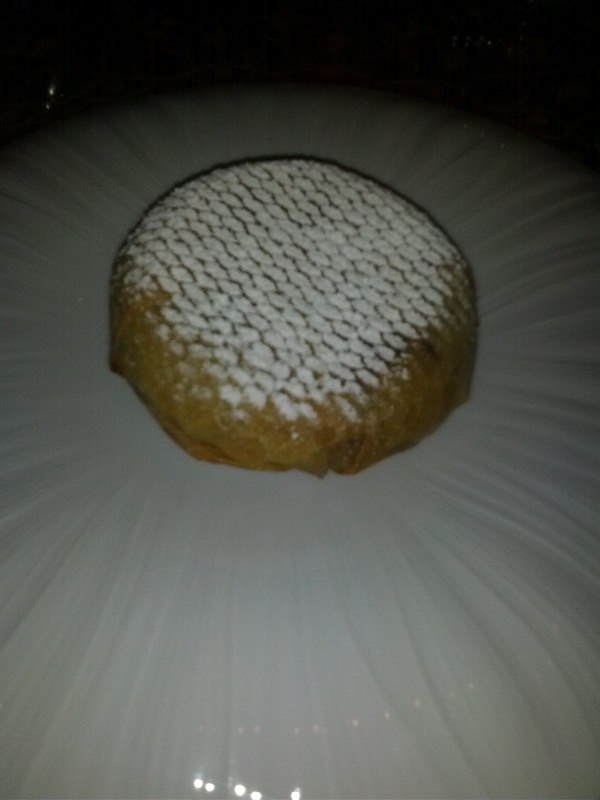 Duck confit basteeya, raisin, almond. $22. This is their signature dish. 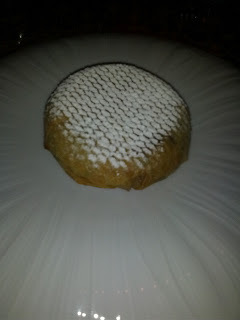 Spiced duck confit, raisins, almonds, wrapped in filo dough, topped with powdered sugar. This arrives as one giant duck pie, but they cut it up for you and serve it. I found this annoying, since we had one vegetarian and had to explain not to give him any, and then they gave me a far bigger piece than I wanted, etc, but once we tried to cut the remaining piece ourselves later, I understood why. Our knives just butchered it, causing the whole thing to fall apart. Anyway. This was another dish that everyone talks about. Apparently a few years ago it used to be a more traditional version with chicken, but they switched it to duck confit somewhere along the way. The restaurant clearly considers it their signature item, the waitress recommended it, and like I said, all of the reviews talk about it. None of us were particularly excited about duck confit, but figured we HAD to try this. In concept, I could see liking this. From reading the reviews, I knew it would be fairly sweet. Meat pie? Check! Filo dough? Check! But, I just didn't like it much. The filling was well spiced, and the mix of savory duck and sweetness from the raisins did work. The filo dough was crisp and buttery, but I felt like there wasn't nearly enough, it was mostly just the filling. The powdered sugar went well with the filo dough, but it is funny to see powdered sugar not on dessert or brunch! I wouldn't order again. And $22? It was big, but not that big (it was an appetizer). Again, a dish that no one particularly wanted to finish. 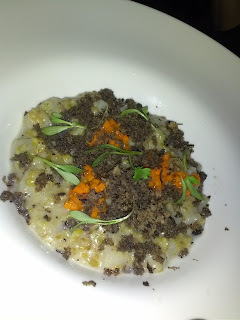 Green farro, scallop, himalayan truffle, carrot. $22. This was a risotto style dish. Again, as I ordered, the waitress gave a warning that the scallops would be chopped up and integrated into the dish. If I hadn't already read about this, I could easily see expecting a seared or grilled scallop atop some farro, with carrots on the side or something. This was the most highly recommended entree I saw in reviews, and the waitress said it was one of the best. 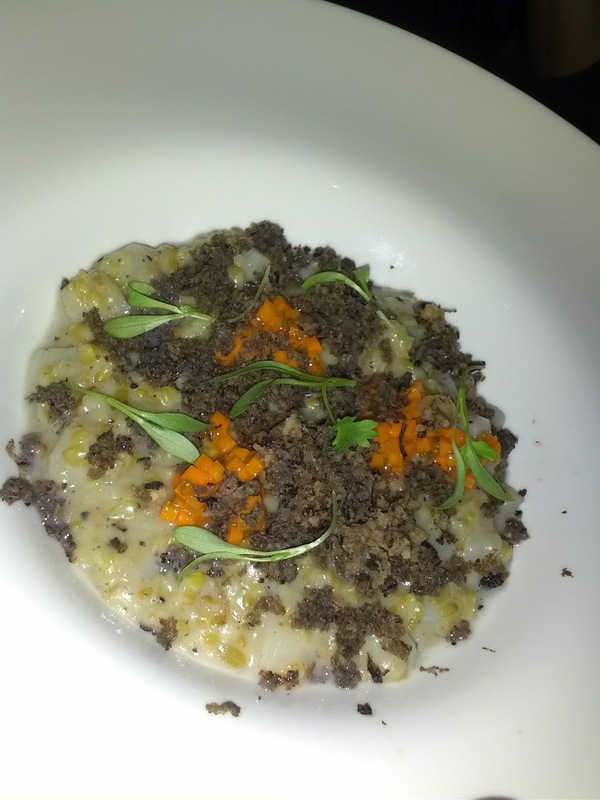 And I love scallops, farro, and truffles, so it seemed like a clear winner. The scallops, as the waitress said, were diced and mixed in. They were totally lost. No flavor whatsoever. The only thing they did was add a little different texture from the farro grains. Extremely disappointing since I love scallops. The carrot was a surprise: lightly pickled, in tiny little cubes, and raw! They provided a great crunch and flavor. The himalayan truffles were generous, with a very strong earthy, woodsy flavor. They added the only real good flavors to the dish. Note: these aren't anything like french truffles, much more similar in flavor to just any old wild mushrooms, which was a good thing since we had a truffle hater amongst us. The farro was overcooked in my opinion. Definitely more mushy that I like it, no where near al dente. And green? I don't get it. The sauce was just kinda oily and heavy and didn't have any flavor. This was just really disappointing. There wasn't any flavor to the majority of this dish, it was like a mushy, flavorless porridge that was somehow made of farro and scallops, but you'd never know it. The carrot and mushroom were actually pretty tasty, but they couldn't save this dish. We didn't come remotely close to finishing this. (I took it home to eat the next night, and the flavors had developed a little bit more, but the sauce got even more oily and kinda nasty). 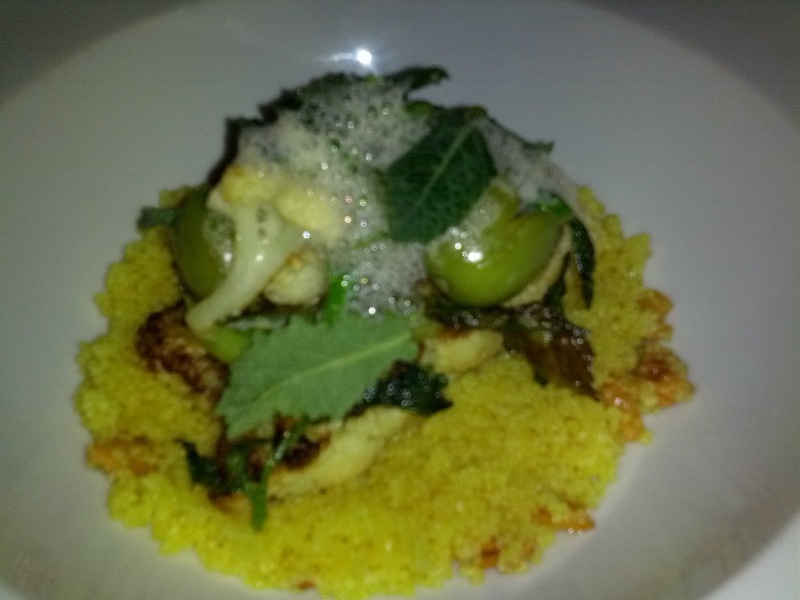 Brassicas , couscous, almond, castelvetrano, harissa. $19. I didn't have this, but our vegetarian dining companion seemed to enjoy it enough. 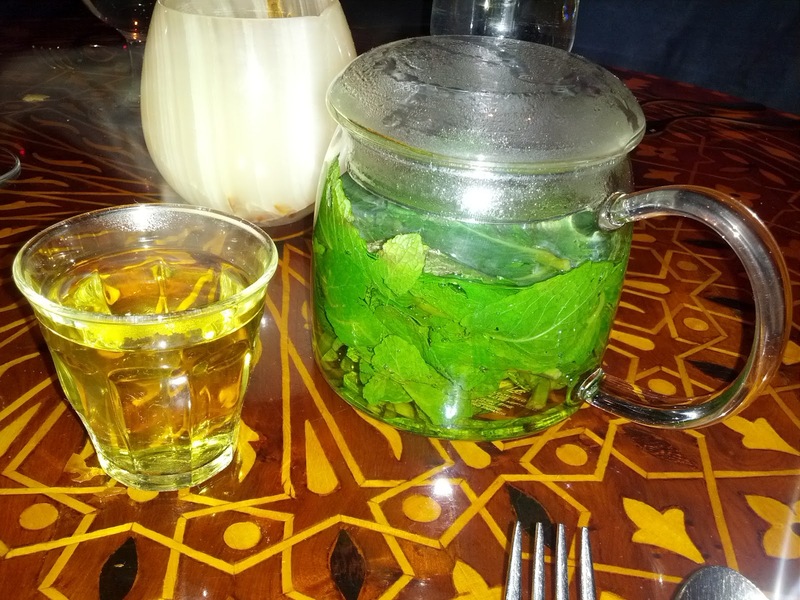 Tisane, herbal, fresh mint. $5. Well, shame on me for expecting just mint tea. I guess I knew that Moroccan tea is usually sweet, but I wasn't expecting it. 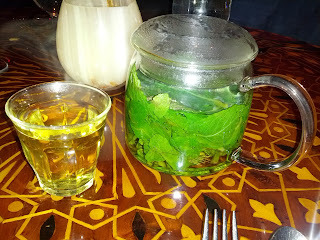 I just wanted a nice cup of warm mint tea, and this was crazy sweet and not at all what I wanted. My dining companions took this off my hands and seemed to enjoy it. Chocolate brioche french toast, green cardamom, coffee, hazelnut. $10. We were there just a day or two after one person's birthday, so I mentioned this to the waitress. 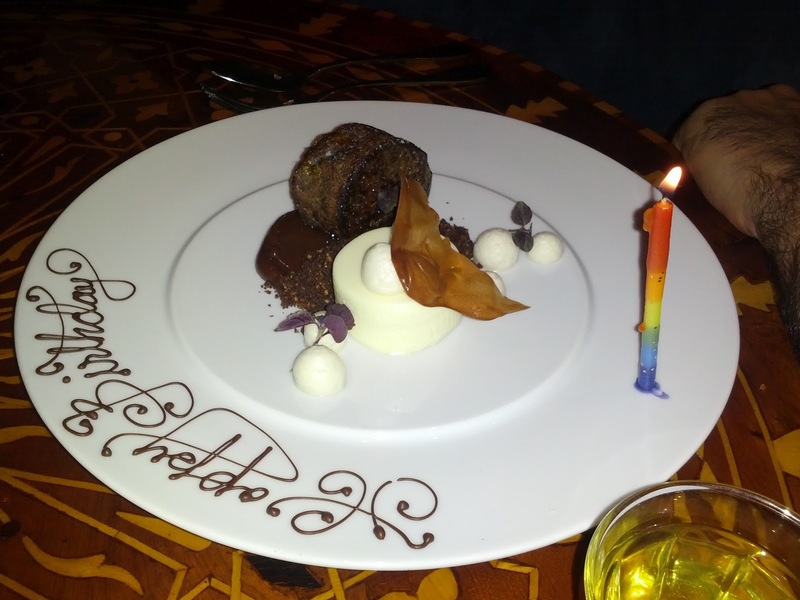 They wrote Happy Birthday on one of the desserts we ordered and included a candle. Thanks, but most Michelin starred places do much more for birthdays! Anyway. I wouldn't really call this chocolate brioche french toast. It was more like a small moist chocolate cake. It was served warm, which was nice, but it wasn't particularly interesting. It was served atop a bunch of coffee soil, a decent pairing, but there was far more of the soil than of the "french toast" itself. And then there was a huge pile of cardamom flavored cream. I think we all expected it to be ice cream, or something more custardy, given how much there was (bigger than the cake part itself), so we all took big spoonfuls of it, but it was just a cream. A spoonful of it was pretty awful on its own, a little with the cake was ok, but the cardamom didn't really go well with the chocolate. There was way too much proportion-wise for the dish. There were also a couple dots of some foam and a hazelnut flavored candy. Overall, nothing really good going on here. 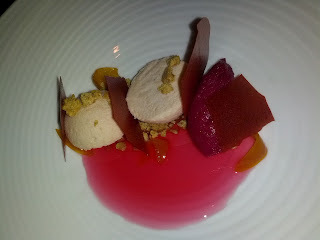 Strawberry parfait, beet sorbet, rhubarb, kumquat, pistachio. $10. The birthday boy liked this one, so that was good. I can't say it really came together for me though. The beet sorbet was indeed a beet sorbet. Very strong beet flavor. I like beets, I like sorbet, I like creative desserts like this ... but beets and strawberries? It didn't really work for me, at all. I think the beet sorbet would have been really fun as a palette cleanser paired with something like a crème fraîche sorbet. Mmm, yeah, I could see that really working. But with this dessert? Not at all. The kumquat came as candied peel, just a few tiny pieces on the plate. Just standard candied kumquat, but I find that quite delicious. I wish there was more of it! Went great with the rhubarb and strawberry flavors. The rhubarb was in the sauce. Kinda sweet and cloying to eat on its own, but it went ok with the mousse part. The strawberry was in the sheets of fruit candy, which were like a fancy version of fruit leather. Sweet, nice flavor, enjoyable enough, although awkward to eat. The pistachio crumble got soggy really quickly from the sauce, and seemed too bitter for the dish. The mousse was fairly light and fluffy and I didn't find it all that flavorful. I think it was strawberry? Overall, I couldn't really find any bites that made sense, no combination of the ingredients that worked together well. I liked the kumquat and strawberry candy, but those do not a successful dessert make. 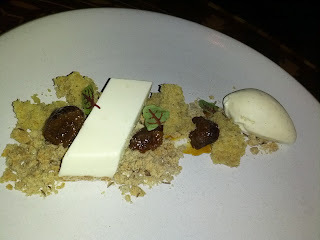 Lavender panna cotta, malted vanilla ice cream, walnut cake, rye. $10. This was my favorite of the desserts. I ate pretty much this entire thing myself. It wasn't worth ordering again though, just better than the others. The panna cotta was decent, well set, good consistency. It had a strong lavender flavor that I didn't particularly care for, but was as advertised. It was atop a crunchy, sweet, filo dough? base, that was delicious. I'd have preferred this to be a different flavor, but it was done well for what it was. The walnut cake was just ... cake. I didn't taste walnut. It wasn't particularly moist or flavorful or anything. Just ... cake. Just there. There was some stewed fruit on here as well, we think it was prune? Not really sure why it was there, it went ok with the boring cake. The malted vanilla ice cream was delicious. Creamy, good flavor. Yum! I really enjoyed it with the crumble on the plate. Speaking of the crumble, perhaps that was where the rye was? I'm not sure. Whatever it was, it was tasty, and I'm glad there was so much of it. It went well with the panna cotta, although it was a little hard to cut off a chunk of the panna cotta and try to get some crumble with it. But as I said, it went really well with the ice cream. I don't really understand why a panna cotta would come with a side of ice cream though. I'm glad it did, as I genuinely enjoyed my spoonfuls of ice cream and crumble. They were the highlight of the meal actually. But panna cotta with cake? Panna cotta with ice cream? Hmm. 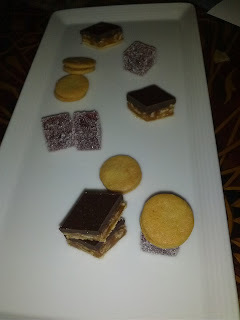 Mignardises: raspberry gelee, "nutter butter", caramel chocolate crunch. And ... moar dessert. Yes, as usual, I had a lot of dessert. 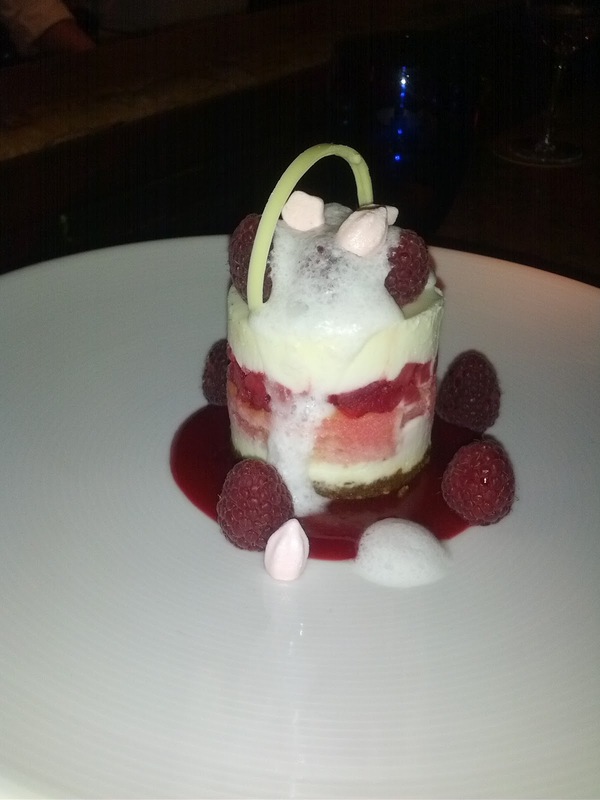 The raspberry gelee wasn't very good. I wouldn't have been able to identify what flavor it was if we weren't told. The "nutter butter" was just two tiny, thin, crispy, peanut butter cookies with some pb filling inside, but it tasted exactly like a nutter butter. Or, at least, what I remember nutter butters tasting like. It has been years since I've had one, but I used to eat them all the time, as my grandmother always had her cookie jar full of them :) Brought back so many memories! The caramel chocolate crunch was a soft caramel layer with crispy rice puffs in it, topped with chocolate. The caramel wasn't that great, the chocolate was just a forgettable milk chocolate, meh. I rarely eat out on Saturday nights. It is always such a hassel to get reservations at places that take them, and waits are always long at places that don't. But it was pouring out, so I decided we'd take advantage of the fact that everyone hibernates when the rain comes out, and try out luck at going somewhere that is known to have waits. Like sushi! As you know, I've been on a quest to find a good goto sushi place - somewhere with really high quality fish, good atmosphere, and where I don't need to wait 3 hours. I've been slowly working my way through my big list of recommendations, hoping to find somewhere that I can fall in love with. It still hasn't happened, and I've hit up almost all of the recommendations I've received at this point. I still love the appetizers and rolls from Sushi Zone, I just wish it was possible to go there and not wait 2 hours :) And the omakase from Sushi Sam's is still my favorite nigiri, but it is all the way in San Mateo, and definitely on the pricer end (although, it comes with dessert, decent dessert at that!). 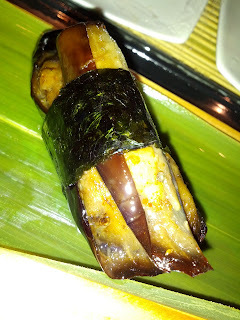 Anyway, tonight we checked out ICHI Sushi, in Bernal Heights. Relatively new (only a year or two old). There were a handful of tables, plus 9? seats at the sushi counter. We walked in at 7pm and could have been seated at a table immediately if we had wanted, but I'd read a lot of reviews that all said the same thing: sit at the counter, in front of Tim, and get omakase. The estimate for a wait was only 30 minutes, so we went to run errands while waiting, and they called us when our seats were available. Not bad at all. Like everyone says, sitting in front of Tim is a good time. The chef/owner is friendly and personable, happy to tell you about the products he is working with. He is clearly proud of his work and his ingredients, and his passion shows through. He's sourcing ingredients from the places he truly feels are the best, but is not flashing it in your face. The menu is very simple, yet deceiving and understated. A few hot appetizers, a few salads, some very simple rolls (no crazy Flying Kamakazi Dragon Spaceship Rolls with mayonaise and 16 other ingredients), and some nigiri. But there are interesting preparations hiding everywhere, just not acknowledged, like the fact that the proteins for the hot appetizers, like the Yuzu Chicken Wings, are cooked sous vide, although the menu never lists this. Or, the tamago is made from jidori eggs, which he acknowledges are far more expensive, yet yields a better custard flavor due to the bigger yolks. 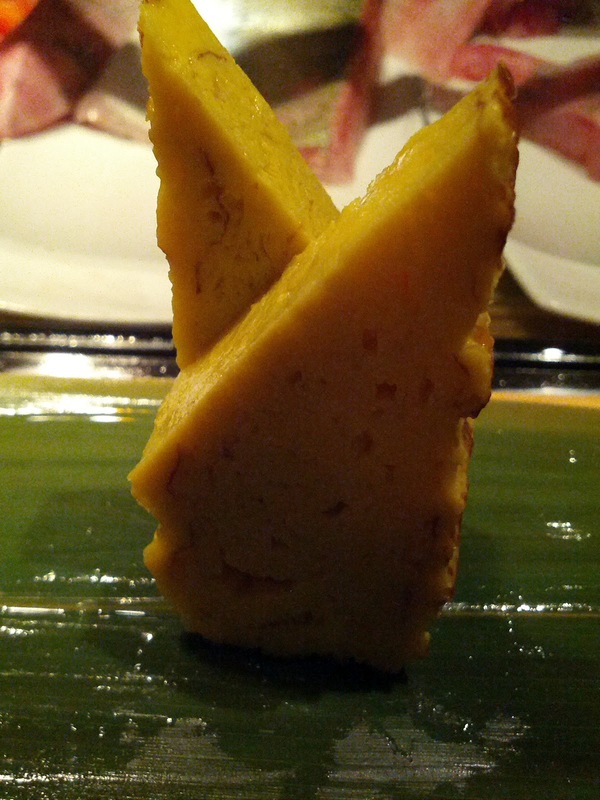 And the menu just lists it as standard tamago. And the nigiri just lists the name of the fish. "Tai" it will say. You expect a piece of sea bream on some rice, perhaps a little wasabi under the fish. 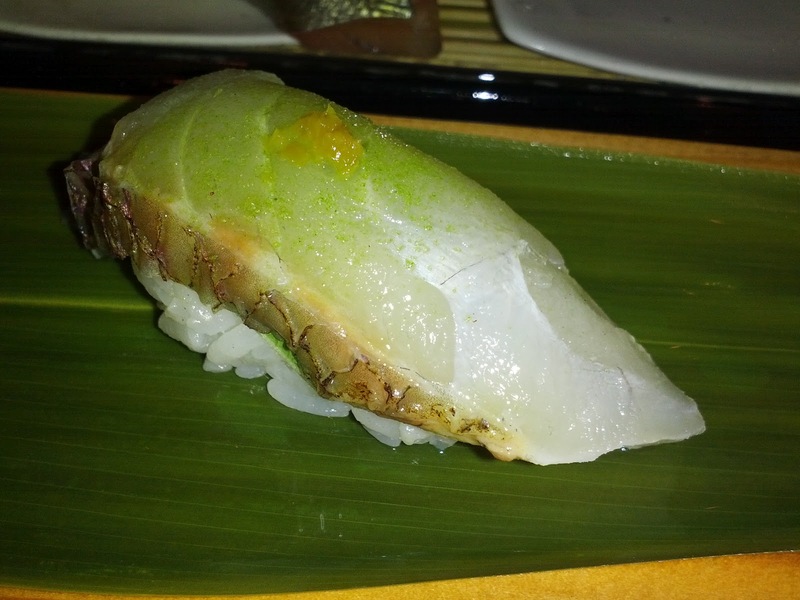 Instead you get your sea bream and rice, but also a shiso leaf, and it is brushed with kabosu juice, sprinkled with green tea salt, and a mound of yuzukosho is dotted on top. It reminded me slightly of Sushi Sam's in this way, with all of the nigiri arriving pre-sauced/seasoned, and we were instructed to not use soy sauce. The flavors however were far more subtle than at Sushi Sam's, usually just a swipe of some kind of sauce and a little bit of garnish, where Sushi Sam's tends to bring on bolder flavors and include much larger components, a slice of kiwi, a pile of pickled onions, etc. 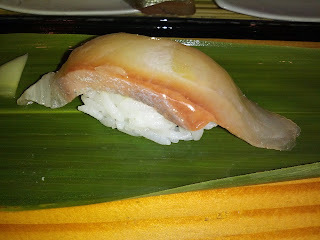 The fish was fresh, but no pieces had the wow factor that I've often experienced at Sushi Sam's. I enjoyed sitting at the counter and interacting with Tim and the regulars. This is clearly a place with repeat customers, and I can see why. If it was in my neighborhood, I'd go back. The fish was decent, the atmosphere casual and relaxed, and like I said, Tim really made the experience enjoyable. It wasn't anything particularly memorable however, and I'm unlikely to trek all the way there again. One big issue I had is that our bill didn't end up matching the prices on the menu. Almost every item was received we were charged $0.50 - $2 more than the price on the menu we were handed. I'm not really sure why, and didn't notice it until I went to write this post and saw so many discrepancies. I don't think the prices we paid were unfair or anything, but it seems wrong to not actually charge the price the menu says. We ordered the omakase, and asked for no hot foods, just to focus on sushi. A leaf was placed in front of us with a pile of ginger, and we were off! The ginger was really gingery. It tasted less pickled than normal and more like actual ginger. We weren't sure if this was something we preferred or not, but it was noteworthy. 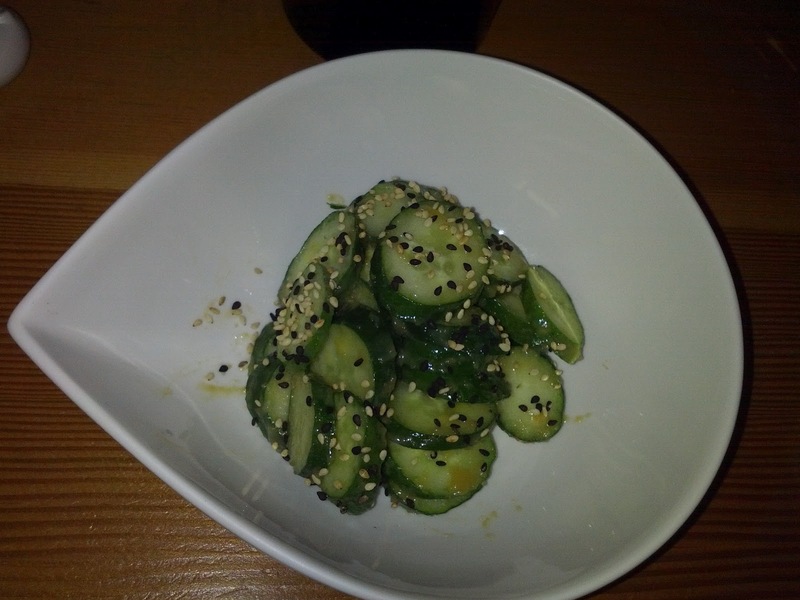 Cucumber Salad: Japanese Cucumber, Miso-Tahini Dressing, Sesame Seeds. $6.00. We started with a cucumber salad. I was actually really disappointed when I saw this, as I was expecting just to get sushi. However, it was really fresh and tasty. The cucumber had an awesome crunch to it, it had clearly been freshly sliced. The miso-tahini dressing was really delicious, (I love tahini! ), and the miso added more depth. It was a tiny bit too salty, but only when I got too much on a slice. I didn't actually care for the additional sesame seeds, I thought there were far too many and rather than adding a textural crunch they just coated the cucumber too much. Maguro, Big Eye Tuna, Philippines, $7.50. Our first piece was a generous chunk of maguro. Deep red and excellent looking It was a nice cut of fish with a decent flavor, you knew it was clearly tuna. It was brushed with white soy sauce, which I didn't taste at all. It was my dining companion's favorite piece of the night. Isaki: Three Line Grunt, Wild, Japan. With shiso, yuzu kosho. $8.50. Next up was the isaki. I'm not sure I've ever had grunt before! My favorite part of omakase is that I get to explore new fish. I didn't really care for this at all. The fish was had a strange texture, really chewy and stringy. I'm not sure if it is supposed to be like that or not. The yuzu kosho (made from yuzu rind, salt, peppers) added a surprising spicy kick that I enjoyed. This one was really surprising, texture-wise. My dining companion exclaimed "I wouldn't even know that was fish!" We were told it was cured, but it looked just like a normal piece of nigiri, so weren't expecting something so soft and pliable. Such a strange mouthfeel for sushi. I think I liked this, but I was so thrown off by the texture that missed out on the flavors. It was certainly unique, I'd never had cured fluke before. I'd order it again to focus more on the flavor next time! Speaking of flavors, at this point, I did notice that the rice was really starchy tasting. Due to the very light seasoning/saucing applied to the fish and our instructions not to use soy sauce, I felt like the rice was often taking over the flavors, rather than highlighting them. It was also really sticky, and not particularly sweet or vinegared. I didn't like it, and stopped including it for the most part at this point. Tai: Japanese sea bream. With shiso, kabosu juice, green tea salt, yuzu kosho $5.75. Wow! And I was just complaining that the fish wasn't all that sauced or seasoned :) The tai was a great texture, firm yet soft at the same time. It had a very light flavor, which meant that you tasted all of the extras that Tim added. The shiso leaf gave a refreshing quality, the kabosu added some acidity, the yuzu kosho gave it a kick, and the green tea salt was awesome. These flavors all combined together pretty nicely. A good piece of fish to showcase of the sauces and seasonings. Sawara: East coast spanish mackerel. With white soy mirin, ginger, scallions. $6. I had no idea that the east coast (yes, of the US), had mackerel. Hmm, and I grew up there! It was interesting to see so much of the featured fish not actually being from Japan. The fish was really soft, almost mushy. I didn't care for it that much. The fresh grated ginger and scallions on top were fresh and lightened it up. I didn't really taste much from the white soy mirin. (It is possible that this is the Aji instead, I'm missing one photo and not positive which was which). 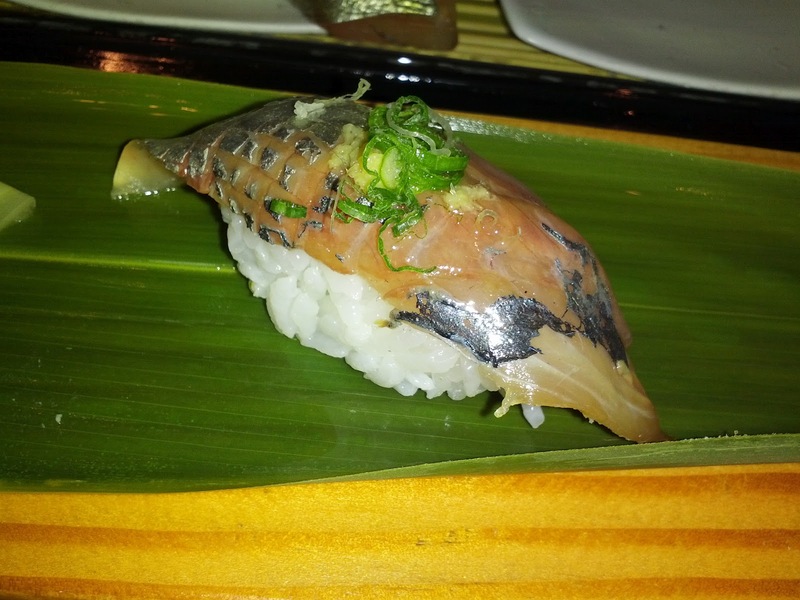 Aji: Horse mackerel, wild, Japan. With ponzu gel, fresh ginger, scallions. ($8 menu, $9 bill). 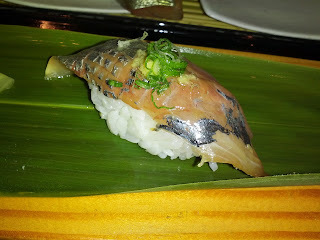 Unlike the Sawara, I loved the texture of this mackerel. Firm yet soft, really nice to bite into. 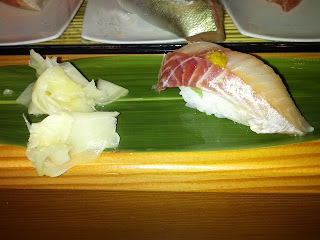 The flavor was really light, not remotely fishy, which I often dislike with Aji. The ponzu gel added some nice flavor, and again, the ginger and scallions on top were crisp and fresh. Kona Kampachi: Hawaiian Amberjack. White soy sauce, sake gel. ($6.50 menu, $6.75 bill). Another piece of fish with a good firm texture. The sake gel added a lot of flavor that I really liked, although it was a little strange to have such a slippery, shiny piece of fish. The white soy sauce came through in this case, perhaps a little too strongly, as it was kinda salty. 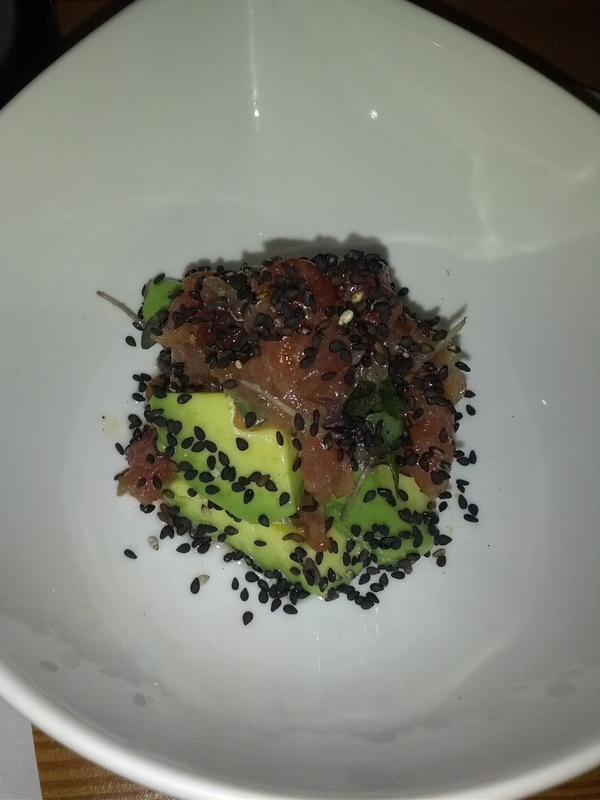 Tuna, avocado, sesame seed salad. Meh. Fresh enough avocado, ok tuna, again too many sesame seeds. Lightly marinated in something. 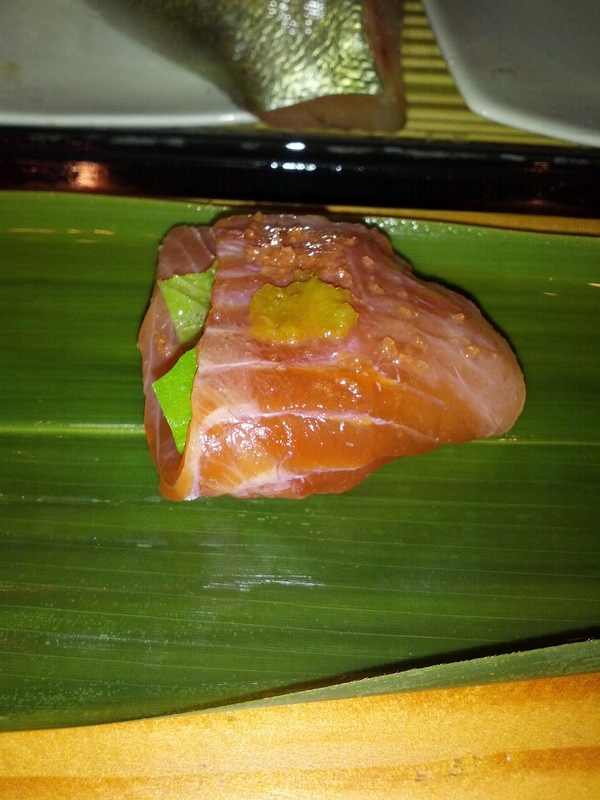 The tuna was a little mushy and not as flavorful as the nigiri preparation we started with. Umi Maso: Ocean Trout, Iceland. With shiso, yuzukosho, and Hawaiian red sea salt. $6.50. Heh, at this point Tim noticed me not eating the rice and gave me this one without it. This was my favorite piece of fish, hands down. I've noticed lately that salmon and trout tend to be my favorites, which is funny, because I really don't care for cooked salmon much at all. I love it raw, I like it smoked, but really, really just don't like it cooked. Anyway. The fish was perfect, nice, firm, flavorful. And the Hawaiian red sea salt was absolutely delicious! Nasu: Japanesse eggplant. ($4 menu, $4.75 bill). I was full at this point, and we told Tim we were done. 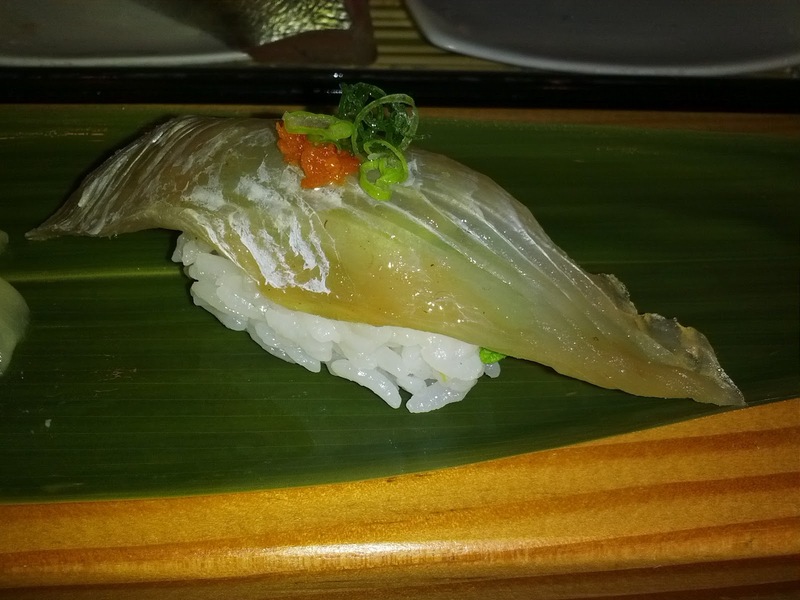 But I had read in a bunch of Yelp reviews that the nasu was particularly good here. Of course, I've learned not to trust the Yelpers, plus, who on earth gets the eggplant when you can be getting more fish instead? Or when you've declared yourself done? But then some regulars came in and ordered it. I asked them how it was, and they said it was really good. I asked Tim how it was, and he said it was great, explained that it was marinated in soy, salt, and pepper. It was good! My dining companion was very skeptical as he often doesn't like eggplant (too slimy, too full of seeds, etc), but he enjoyed this too. Served hot, with a crispy skin, and a soft but not mushy interior. I'm very glad we ordered this, it might actually have been my favorite thing of the evening. Tamago: Jindori egg omelet. ($4.50 menu, $4.75 bill). And if you've been reading my sushi posts, you know I always finish with tamago for "dessert". I'm a dessert girl, and most sushi places don't offer much in the way of dessert, so this has become my goto sweet finish. Unfortunately, I've been really, really grumpy at most of the tamago I've had lately. It has been not sweet, too eggy, too fried, etc. Just disappointing over and over. But, another set of regulars ordered this. They told me it was fantastic here. Tim chimed in that it was just freshly made. So, I definitely had to try it. This was probably the most moist tamago I've ever had. Perhaps because it was so fresh? Not too eggy, sweet but not too sweet, just really nicely done, very fluffy. Tim explained that the jindori eggs he uses have far larger yolks (apparently very yellow as well), which makes the omelet much richer and more custard like. Whatever did it, this was definitely a good execution. I enjoyed it plain, with rice, with soy sauce, and with both soy sauce and rice. Not sure which way I preferred it the most, it was all good. Uni: Sea urchin, Mendocino. $7.95. Uh, I said I was done several pieces ago, didn't I? And I'd had my "dessert". We actually had our bill on the table, when the topic of uni came up. Tim was telling us how he gets his uni locally from Mendocino and thinks it is the best uni in the world. Better than Santa Barbara, Maine, Japan, etc. I've got a thing for uni, particularly these days, so I had to have some. In retrospect, I shouldn't have ordered this. The last three pieces I'd had were all the highlights of my meal (the trout, the nasu, the tamago) and I was ending on a good note already. And if Tim thought it was amazing, wouldn't he have included it in our omakase? But ... uni! I couldn't resist, even though we no longer had chopsticks, plates, or anything, and our bill was sitting in front of us. 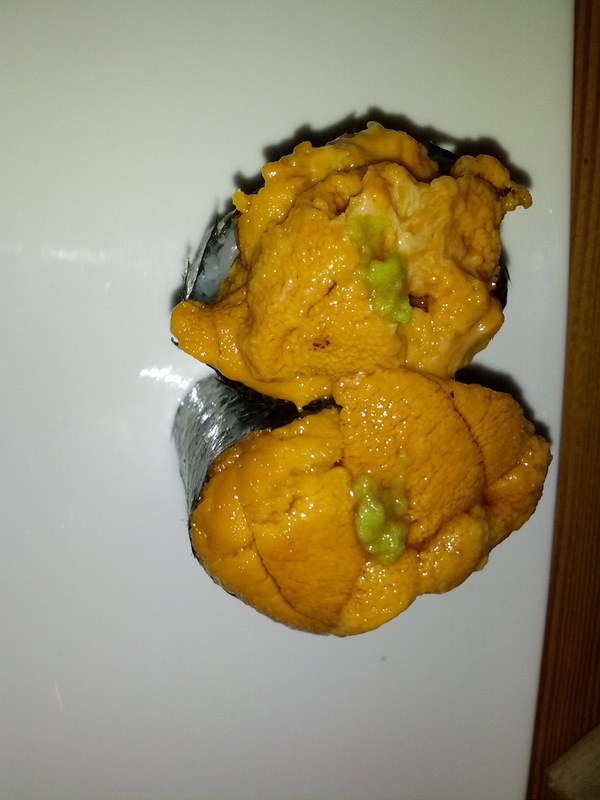 The uni was ... ok. Creamy enough I guess, but not really all that flavorful. It definitely didn't have the richness and real strong uni flavor I was looking for. Friday nights are always weird for eating. At work, we celebrate with food and drinks starting at 4pm. Depending on the week, the food ranges from just chips and dip or crudités and dip, to themed extravaganzas, and always includes a few dessert selections. Often, I'm not up for a full dinner after all this. This week was a German theme, with hot dogs, brautwursts, bockwursts, soft pretzels, fancy mustards, pickled stuffs, spaetzle, and then the standard crudités and eggplant dip, chips and salsa, fresh fruit, and profiteroles! I wasn't exactly needing a whole lot of food after all of this, so a couple of us just headed down the street to Boulevard, to sit at the Chef's Counter and have a few appetizers (and dessert!). I've reviewed Boulevard a few times in the past, so I'll skip all the details about the place this time. We were seated pretty quickly at the Chef's Counter, one of my favorite places to sit. I'd like to apologize to my dining companions now, as I get so distracted sitting there that I'm probably horrible company. I really, really enjoy watching the kitchen work, and in particular, the pastry kitchen. ZOMG, the desserts just look so amazing. Dinner tonight was fairly disappointing. Several of the dishes we tried were the new seasonal preparations of some of their classics (the foie gras duo and the ribbon cut tuna), and I think they need to work on these new preparations some more, as past versions of these have been much more successful. Amuse bouche: Taro puree, spring radish, pickled mushrooms. I love that they still include the amuse when you sit at the bar and just order appetizers. 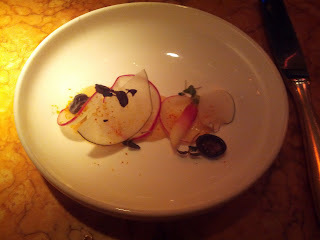 This was an assortment of different varieties of radishes, some sliced thin, some in bigger chunks, atop a puree, with two tiny little mushrooms on the side. The radishes were crispy and fresh. Super simple, but really flavorful. The focus here was on the radishes being fresh and awesome, and they were definitely allowed to just shine. I'm pretty sure the puree had miso in it, and was rather like a Japanesse miso mayonaise. It was tasty and I enjoyed dipping the radish into it. The mushrooms were tiny little flavor bursts as well. They didn't really pair with the radishes or puree, but they were tasty. Overall, a nice dish. I generally really like the amuses served here! One diner said this was his favorite dish of the evening. Hudson Valley Foie Gras: Pan Seared and Chilled Torchon with Wild Rosehip and California Strawberry Confit, Negroni Gel, Candied Pecans, Maple Oat Toast. $29. It is no secret that eat a lot of foie gras these days. And yes, I'd just had foie gras the day before. And I was here for a "light" meal after my evening of sausages already. But ... this is pretty much why we choose Boulevard (besides convenience of location). I somehow still had never tried the foie gras at Boulevard, even though one of my frequent dining companions has told me time and time again that this is one of his favorite preparations in the city. I was so excited! Unfortunately, this was a total letdown. Said dining companion agreed that this did not live up to the past preparations he'd had at Boulevard. There was a ok sized seared lobe of foie gras atop two chunks of toast. On the side were two piles each containing a few roasted strawberries and pecans, some gel, and a very small chunk of torchon. The "maple oat toast" did not have any maple nor oat flavor. It was just toast. Which is fine, but the maple oat flavors did sound like they'd pair well with the foie and I was looking forward to them. Had the menu just said "toast", I'd have nothing really to say here. They were just plain, simple, inoffensive toasts. It was a little strange to have two chunks like this, as you obviously needed to cut the components all down to size, so it didn't quite make sense to have these already cut, but into sizes that weren't appropriate. The "candied pecans" were not candied. They were just pecans, perhaps toasted? Again, if the menu hadn't said anything about them being candied, I'd just have written them off as boring little pecans on the side, but again, I was looking forward to the sweet candied flavor pairing with the foie gras. They were fine, but didn't really work with the seared foie gras. The strawberry confit was fairly tasty, hurray for strawberry season! However, it did not pair well at all with the seared foie gras. I was really disappointed with this pairing. 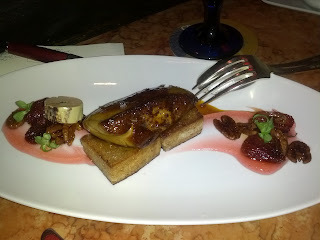 The seared foie gras and the strawberry had a very similar texture, so there was no fun in combining textures, but moreover, the flavors just didn't work. The sweet strawberry and the rich foie just really clashed, I'm not sure why. I tried a couple bites like this and really, really did not like them at all. The seared foie was only ok. Seared foie gras should NEVER just be "ok". It was sorta creamy, it was rich, but it wasn't particularly well seared nor did it have much flavor. Certainly not a great execution. A week ago, a friend who had never before made seared foie gras seared it better than this. Sadness. And as I already said, it didn't go at all with the strawberry. Execution wise, it was nothing compared to the seared foie gras from Alexander's. It was an ok portion for the price point, but similar places serve slightly larger pieces for slightly lower prices. The torchon was decent, nice and creamy consistency. The portion was very, very small however, particularly compared to the other elements on the plate. It was barely the size of one of the strawberry chunks! Why so little of this? It was definitely the best part of the dish as well, and paired really nicely with the strawberry. A chunk of the toast, with some torchon, with some strawberry, and with a pecan was pretty good. Bite of the night for me for sure, although nothing I'd go back for. Foie gras lover I am, I would not order this again. I'll give them another try sometime I'm sure, once they change up the pairing, and I'll hope for better execution on the sear. Such sadness. 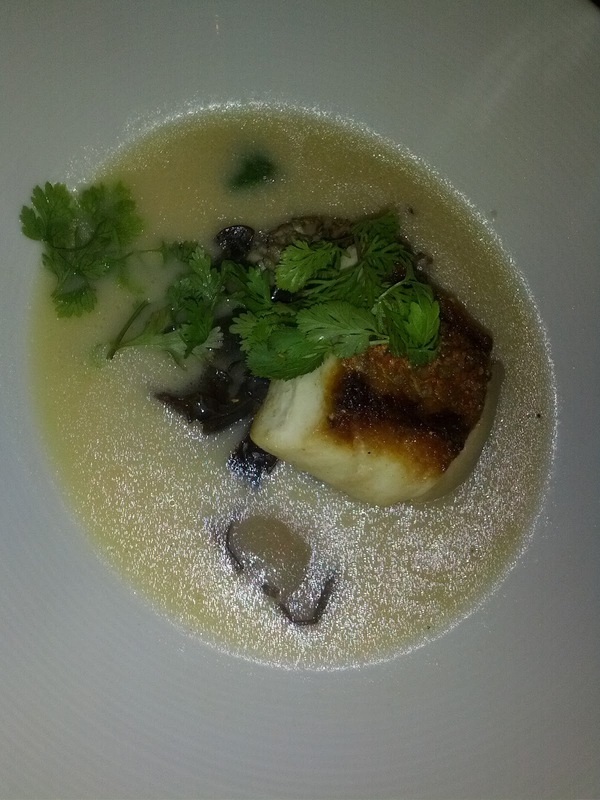 American Red Snapper & Thai Lemongrass Bisque, with roasted maitake, abalone, and oyster mushrooms, mint & coriander. $17.75. This dish had a lot of potential, but fell short due to some execution and general concept issues, the biggest being that it was incredibly awkward to eat! The dish arrived without any broth, which was poured in tableside, a fun touch. The broth was almost amazingly delicious. I love a good thai lemongrass bisque! There were some very nice flavors in here, however, it was far, far, far too salty. The flavors could have been incredible, but were completely overpowered and ruined by the saltiness. In retrospect, I perhaps should have said something, I really don't think it was intended to be that salty. The mint and corriander were served in a rather unappealing mangle. Boulevard usually has such pretty plating, this surprised me. Also, since they were floating in the broth, it was very hard to separate out just a little of these to eat, you either got none, or a big mass which was overpowering. These garnishes would have been good flavor components, but did not work in this form. Good idea conceptually, but didn't work in practice. The fish was a generous piece of local snapper! I was pleasantly surprised to see such a large chunk of fish in an appetizer, particularly at this price. An incredible value! Rather than being cooked in the broth, it was pan seared as a big chunk, with a nice crispy exterior on one side. I was actually expecting small chunks of fish throughout the soup rather than a large piece, but I thought this was a fun way to serve it, I generally don't mind cutting up my own fish, and the fish was probably tastier cooked this way too. But again, this turned into a better idea conceptually. It was awkward to eat since I was using a spoon to get broth, but I couldn't actually cut through the seared side with the spoon. So I had to switch over to knife and fork to cut it, and then back to a spoon to get a bite with broth. It was a constant battle of trying to choose if I just kept the knife and fork in my hand and ate the fish without the broth, switched back and forth, or cut it all up at once and then ate it ... I didn't want to have to make so many decisions! Also, crispy seared fish is great, but once it is in broth, it quickly loses the crispiness, so it was disappointing to see the sear and know it once was crispy but then have it be mushy. Speaking of which, the fish was a little on the mushy and not flaky side, but otherwise fairly well cooked and a very nice cut of fish. The assortment of mushrooms again had great promise, but disappointed. I adore roasted mushrooms. I love how roasting brings out such intense woodsy, earthy flavors in them and dries them out slightly to have an awesome texture. I love how assorted mushrooms have such different flavors. I was sooo excited for these mushrooms. But, there were two big problems here. The first is that they didn't really seem roasted. Again, if the menu hadn't promised roasted mushrooms, I wouldn't have been expecting lovely roast flavors and consistencies. Perhaps they were roasted and the crazy salty broth just masked the flavors, and soaking in broth changed the consistency to slimy. I'm not sure. But the bigger issue was again, the awkwardness. They were served as very large chunks of mushrooms and had to be broken down. This is again not a bad idea, I really don't mind cutting my food, but when I'm trying to eat a soup with a spoon, this just doesn't work. It seems like the components either need to be cuttable by spoon, or already cut. I'm really not trying to be lazy, but it was just too overwhelming to be switching my silverware all around constantly, and I felt really rushed because I didn't want everything to cool down too much. Maybe I should have just cut everything up at once at the start? But I wanted to get tasting it, not sit there preparing it! Anyway. I really liked all of the ideas behind this dish. The flavor of the broth (minus the insane level of salt) was fantastic. Seared snapper is delicious. Roasted mushrooms are delicious. But this left me flustered and disappointed. This was a pile of the salad, topped with the tuna, garnished with the furikake, with the fried tofu and aioli on the side. On my last visit to Boulevard, the ribbon-cut tuna was by far my favorite dish, so I was excited to have this and to see the new preparation. Unfortunately, it was just not very good. The salad was thinly sliced turnip and seaweed. The turnip was a little crispy and I think still raw. A rather strange texture combination, but it did look nice (it looked a lot like yuba however, and I kept wanting it to be yuba strips instead!) I felt pretty meh about this, it wasn't bad, but I didn't really have any reason to eat it either. The wild rice and shitake furikake added some fun textures into the mix. And it is fun to say "shitake furikake"! The fried tofu really didn't work. Why do I want fried tofu on the side of my fresh tuna? The last preparation I had of this dish had a grilled tofu that worked better, but in that case, I still felt like the tofu was superfluous. The real problem here was the tuna. It looked good, looked high quality, and the knife cuts were impressive, very uniform. But there was just no flavor whatsoever. If blindfolded, I could have never identified what fish I was eating. Anyway, this just didn't add up to a successful dish. The components didn't really work together and the flavors didn't pop. I think that has been my favorite aspect of this dish in the past, how the flavors can really come out, and here this was just bland, which is surprising, given the large list of ingredients. I would not order this again, but again, I do look forward to seeing what their next version of this dish is, as I've enjoyed it before in the past. WHITE CHOCOLATE RHUBARB ICE BOX CAKE: Graham Cracker Crust, White Chocolate Mousse, Roasted Rhubarb, Coconut Froth, Fresh Raspberries, Meringues. $10.50. This was a cake of many layers: graham cracker crust, white chocolate mousse, vanilla cake, rhubarb, more white chocolate mousse, and then topped with raspberries, coconut froth, and tiny little meringues. The graham cracker crust was delicious, although hard to break through since the whole thing was frozen. Awkward to eat, but tasty enough that I didn't care. Sweet, crunchy, yum! The mousse wasn't really what I'd describe as a mousse, since it was fairly frozen, so it wasn't fluffy. Nor did it have white chocolate flavor. It didn't actually have much flavor at all, just sweet, although not too sweet. Sorta just inoffensive, sorta cold, sorta ice cream like ... just there. The cake was also flavorless and pretty much just there. Again, not offensive, it was fine, but it was just plain cake. The rhubarb was tasty and a nice texture. The raspberries weren't particularly noteworthy, just raspberries, not in season locally. The meringues were too tiny to taste, but cute. The froth was again flavorless, would not have known it was coconut if the menu didn't say so. Far prettier than it tasted. Good thing I had a cake waiting for me at home!